Master servers for the multiplayer were shut down in February 2012. A mod, S4NDMoD, solves this problem by making the game use fans' master server. Not available for purchase in Germany. A standalone follow-up, Enemy Territory, is available as freeware. The PS2/XBox port of the game included a prequel mission, Cursed Sands. Additionally the Xbox port featured DLC maps. Currently, there is no known way to play this content on the PC version. See here for more info. 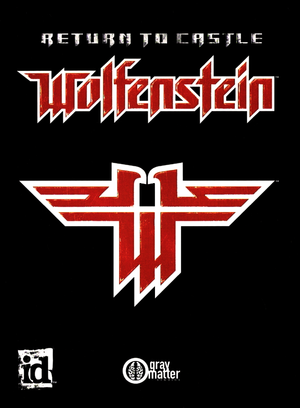 Sold with the Game of The Year Edition or downloadable as freeware. Not officially packaged for Mac, though can still be used on it by manually installing PK3 files. iortcw Adds modern features like VOIP and OpenAL, whilst being faithful to traditional gameplay. 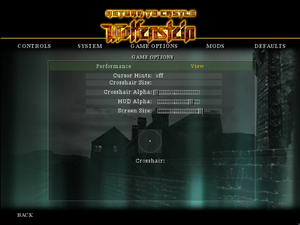 Unofficial Patch by Knightmare Fixes various crashes and adds native widescreen support. RtCW Mac OS X Designed to get around the fact that the original game was PowerPC only and would not run on OS X 10.7 "Lion" or later due to the removal of Rosetta. 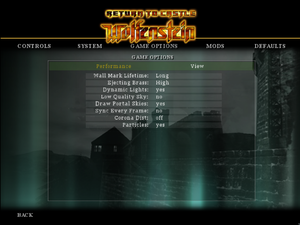 Bibendovsky's RtCW Source port for all RtCW games (single-player, multiplayer, Enemy Territory). 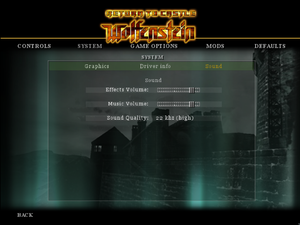 wolfconfig.cfg contains single player settings. Capped at 91 FPS. See Frame rate (FPS). This solution is Vert- (FOV will need to be increased to compensate), but does not require downloading an external program. Launch the game at least once then close it. 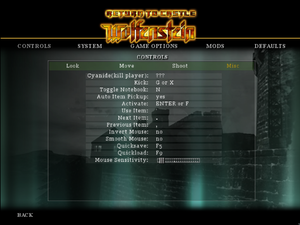 Open wolfconfig.cfg with a text editor. Change the following lines to set the resolution. Change the following line to this value. This solution does not affect the weapon model FOV, but does not require downloading an external program. Change the following line to set the FOV. Add +set sv_cheats 1 to the game's launch options to prevent the custom FOV from being overwritten on a new level load. Stamina and weapon overheating bars logic are tied to FPS. Disabled by default. Use cl_mouseAccel 1 in the console to enable. Open autoexec.cfg with a text editor. Add the following lines (change c to whatever you want). set duck "+movedown; set crouchToggle vstr stand; echo ^3Crouching...^7"
set stand "-movedown; set crouchToggle vstr duck; echo ^2Standing...^7"
Stereo output only. 7.0 with iortcw. For iortcw, see Mute on focus lost. Unofficial translation by «Fargus Multimedia». Download: text, sound. Increasing the game resolution above 800x600 causes the upper left corner of the game to take up the entire screen. 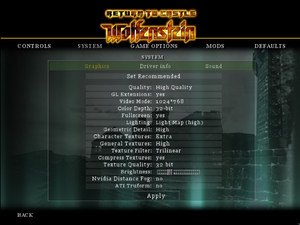 One reason is that game detects a 3dfx driver (possibly caused by nGlide). Change seta r_glIgnoreWicked3D "0" to seta r_glIgnoreWicked3D "1". This game is not coded/optimized to run on modern graphics cards, resulting in frame rate drops on some modern machines. This fix changes the method used to submit rendering draw calls. Change seta cg_bobup "0.005" to seta cg_bobup "0.000". Change seta cg_bobpitch "0.002" to seta cg_bobpitch "0.000". Change seta cg_bobroll "0.002" to seta cg_bobroll "0.000". S4NDMoD is a mod that focuses on fixing exploits and adding necessary features to RTCW multiplayer. A list of features can be found here. Due to the master server being down, this mod is the best solution to make server browser work again. RealRTCW is a SP mod based on iortcw. New weapons, improved sounds and visuals, rebalanced gameplay, new difficulty system. ↑ 2.0 2.1 File/folder structure within this directory reflects the path(s) listed for Windows and/or Steam game data (use Wine regedit to access Windows registry paths). Games with Steam Cloud support may store data in ~/.steam/steam/userdata/<user-id>/9010/ in addition to or instead of this directory. The app ID (9010) may differ in some cases. Treat backslashes as forward slashes. See the glossary page for details.